Almost like the Mojave Desert, where Hektor Maille saved the life of a desert tortoise, and thus still did not really become a hero. In Spanish-speaking countries under the name of Bizcochito are served very different kinds of puff pastry or biscuits. 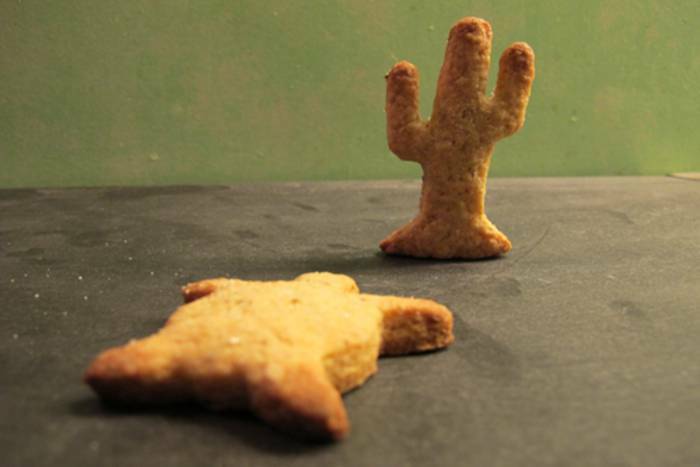 In New Mexico though Bizcochito or Biscochito has a very special significance because an anise shortbread under this name was declared in 1989 to be the official «state cookie». There is no official recipe though – but most sources agree, however, that the New Mexico Bizcochito is made with lard and flavored with anise. Of course, the cookies can be done with butter – but the lard really gives the Bizcochito a special flavor. Bizcochitos can be cut into various forms – but of course, cactus and turtle go particularly well with the adventures that Hektor Maille had to experience in Santa Fe. Warm the lard to the point that it becomes soft. Stir in the sugar to form a homogeneous mass. Mix the flour, baking powder, anise and cinnamon together in a large bowl, mix in the lard-sugar mixture and the two eggs. Knead (about 5 minutes) until the dough comes away from the edges of the bowl and appears as a homogeneous mass. If the mixture seems too dry, you can add a few drops of water - in the opposite case add a little more flour. Form a clump, dust some flour on it's surface, wrap in kitchen foil and put for at least 1 hour (preferably overnight) in the fridge. The longer the dough is cool, the better do blend the flavors. Flatten the dough on a floured surface with your hands in order to obtain a flat pancake. Then roll it out to a thickness of 5 mm. 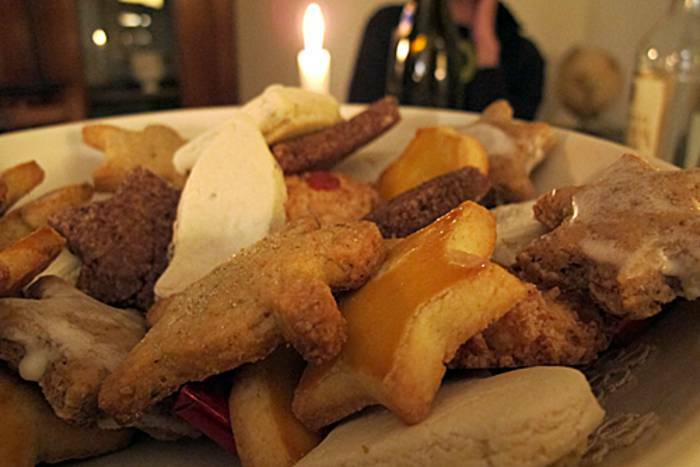 Cut out cookies with small ramekins and place on a baking sheet lined with baking paper. In the middle of a oven, preheated at 200°, bake around 10 to 12 minutes until the biscuits are light brown with slightly darker spots at the edges (the exact baking time depends on the stove). Sprinkle immediately with the mixture of anise and sugar and allow to cool (astonishingly, the sprinkling keeps reasonably well on the surface). The cookies can be kept at least for a week. 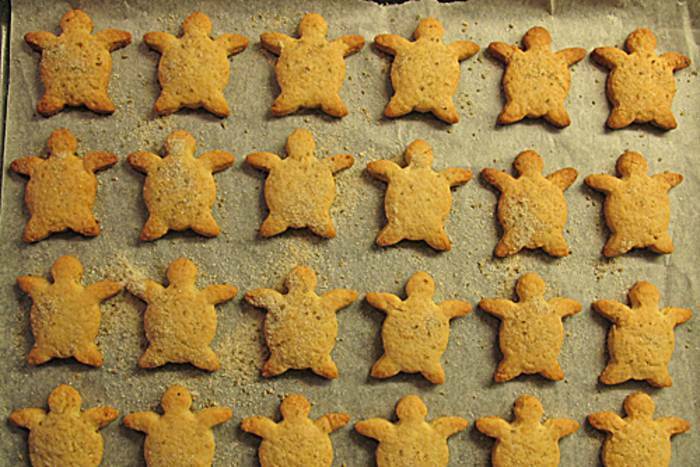 Highly suitable for Christmas: a Bizcochito turtle on a plate with different Advent biscuits. 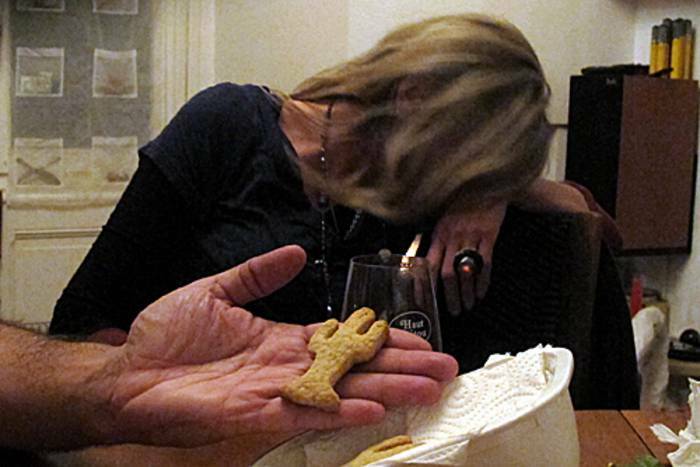 HOIO's cookie-test for Episode 17 of «Mission Kaki», December 19, 2010 in Riehen. Desert dreams? A Bizcochito Cactus on the test bench at HOIO's cookie-test for Episode 17 of «Mission Kaki», December 18, 2010 in Montreux.